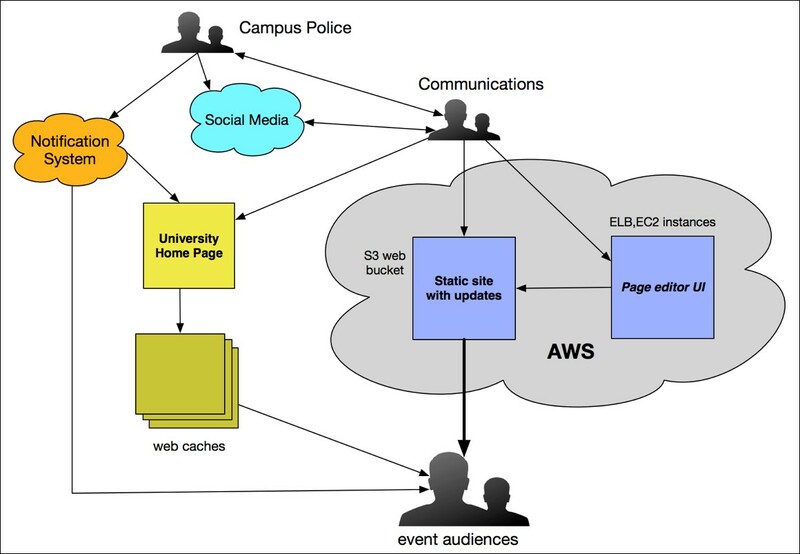 The Georgia Tech Office of Information Technology has taken a first step into cloud computing and emergency preparedness by deciding to host our crucial emergency communications website on Amazon Web Services (AWS). Georgia Tech maintains an on-premises main campus website that acts as the focus of our institute’s communications. We architected the site to use a content management system for easier editing and web caches for handling a large amount of external web traffic. However, many situations, from a campus-wide lock down to a weather-related closing, could easily cause traffic to exceed the limits of our on-campus systems. Preparing for such emergency communication scenarios led our IT office to look to the cloud and AWS for a solution. Our first step was to gather our IT, cyber security, communications, and emergency planning experts and create communication plans for foreseeable emergency situations, such as an active shooter, tornado, or a bomb threat. Our plans explain who communicates what, when, and over what channels. For most campus emergencies, all of our communication channels, from Facebook to Twitter to our off-campus-hosted SMS notification service, will direct all users to one single voice: our emergency website. Over-design – Create a robust infrastructure that has significantly greater capacity than needed for average daily use. Scale Rapidly – Create a flexible infrastructure that can quickly allocate additional CPU, memory, and bandwidth. Redirect or bounce – Send visitors off your local resources to somewhere that can easily handle the greater traffic demands. With the first two options unavailable to us due to time and monetary constraints, we chose to redirect our emergency web traffic to an external resource. Given that rapid, automated scaling is the bread-and-butter of cloud computing, Amazon Web Services was a logical decision. Amazon S3 website hosting is easy to set up. The AWS Management Console was all that was needed to get the initial S3 bucket and site hosting set up. Traffic scaling is automatically handled by the existing Amazon S3 infrastructure. Since Amazon S3 holds trillions of objects and regularly peaks at millions of requests per second, serving data for many major corporations, our extra emergency web traffic will not overload their system. It is affordable, both during inactivity (pennies per month) and in the event of an emergency. For example, in the case of an emergency lasting three hours, involving 30,000 people reloading our homepage every twenty seconds, our total cost should be less than $30. Amazon S3 provides for automatic versioning, allowing us to keep a copy of the page at every stage of an emergency event without extra effort or coding. The limitation of static-HTML-only web pages forced our web designers to focus on what matters most for communication during crises: a quick loading, mobile-first design (one not weighed down by heavy CMS demands). After all, the worst case scenario could involve thousands of people sheltered under desks, reloading our site every few seconds on their smartphones. Our communication staff are first trained in hand-editing HTML via a native S3 client. For easier use, we also created a small web application that provides a simple GUI to edit the emergency page. The application is hosted on two Amazon Elastic Compute Cloud (Amazon EC2) instances, both hosted behind an Elastic Load Balancer. The main benefit of our AWS architecture is our expanded ability to handle large numbers of web visitors in the event of a crisis. In addition, even this simple system has allowed our IT team to become comfortable using several AWS technologies, including: VPCs, EC2, EBS, AMIs, and IAM. Another unforeseen advantage was having this project serve as an exploratory opportunity for our campus’ purchasing department, too, allowing us to figure out the right and legal way for us to consume AWS resources, lowering hurdles for future AWS-hosted projects. Amazon S3 has so far worked well for Georgia Tech given that it has the capabilities we need and is affordable. The Amazon sales and engineering teams are helpful, and we are moving forward with our communications plan. We have a rock-solid website to redirect users to, and we are hopeful that we are ready if and when emergencies arise.